La terapia inmunosupresora no biológica es de uso frecuente en la práctica dermatológica diaria en un amplio número de dermatosis inflamatorias. Su uso debe basarse en el entendimiento de su farmacología –mecanismo de acción, farmacocinética y efectos secundarios– que le permita al dermatólogo hacer un seguimiento adecuado, y la tamización y la profilaxis oportunas antes de su uso. Nonbiological immunosuppressive therapy is frequently used in dermatological daily practice in a large number of inflammatory dermatoses. Its use should be based on the understanding of its pharmacology: mechanism of action, pharmacokinetics and adverse effects, allowing the dermatologist to realize adequate monitoring and opportune screening and prophylaxis prior to its use. 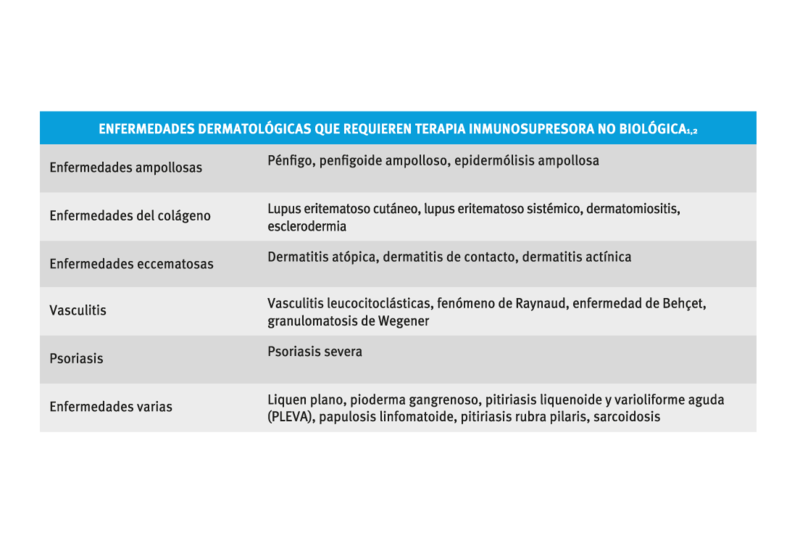 Meyer N, Viraben R, Paul C. Inmunosupresores sistémicos en dermatología. 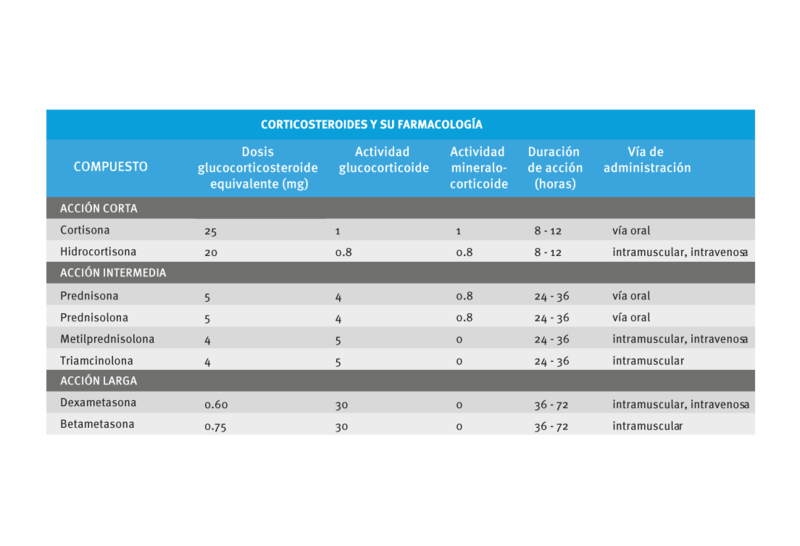 EMC-Dermatología. 2008:42:1-15. Stern DK, Tripp JM, Ho VC, Lebwohl M. The use of systemic immune moderators in dermatology. Dermatol Clin. 2005;23:259-300. Hassan I, Aleem S, Sheikh G, Anwar P. Biologics in dermatology: A brief review. BJMP. 2013;6:629-37. Rosman Z, Shoenfeld Y, Zandman-Goddard G. Biologic therapy for autoimmune diseases: An update. BMC Medicine. 2013;11:1-12. Dutz J, Ho V. Immunosuppressive agents in skin disorders. Clin Immunother. 1996;5:268-93. Dutz JP, Ho VC. 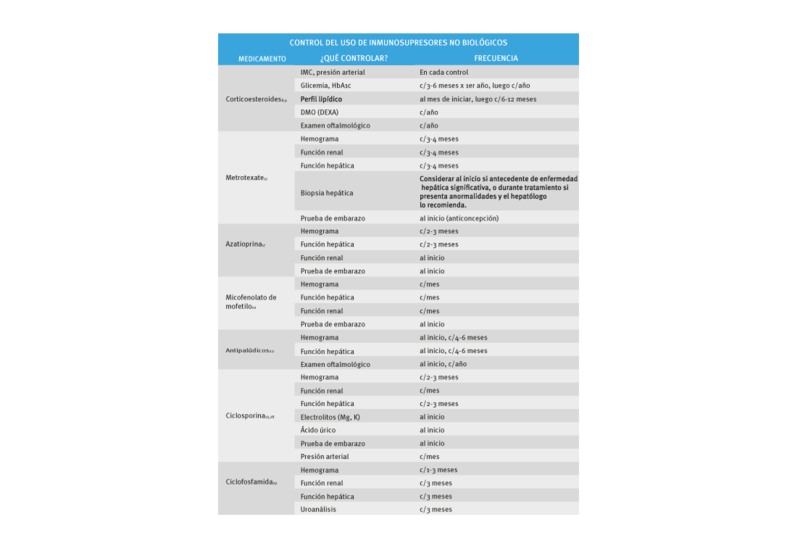 Immunosuppressive agents in dermatology: An update. Dermatol Clin. 1998;16:235-51. Jackson S, Gilchrist H, Nesbitt LT. Update on the dermatologic use of systemic glucocorticosteroids. Dermatol Ther. 2007;20:187-205. Williams LC, Nesbitt LT. Update on systemic glucocorticosteroids in dermatology. Dermatol Clin. 2001;19:63-77. Liu D, Ahmet A, Ward L, Krishnamoorthy P, Mandelcorn ED, Leigh R, et al. A practical guide to the monitoring and management of the complications of systemic corticosteroid therapy. Allergy Asthma Clin Immunol. 2013;9:1-25. Banger CA, Costner MI. Methotrexate in dermatology. Dermatol Ther. 2007;20:216-228. Shen S, O’Brien T, Yap LM, Prince HM, McCormack CJ. The use of methotrexate in dermatology: A review. Australas J Dermatol. 2012;53:1-18. Barker J, Horn EJ, Lebwohl M, Warren RB, Nast A, Rosenberg W, et al. Assessment and management of methotrexate hepatotoxicity in psoriasis patients: Report from a consensus conference to evaluate current practice and identify key questions toward optimizing methotrexate use in the clinic. J Eur Acad Dermatol Venereol. 2011;25:758-64. Meggitt SJ, Anstey AV, Mohd Mustapa MF, Reynolds NJ, Wakelin S. British Association of Dermatologists’ guidelines for the safe and effective prescribing of azathioprine 2011. Br J Dermatol. 2011;165:711-34. Wise M, Callen JP. Azathioprine: A guide for the management of dermatology patients. Dermatol Ther. 2007;20:206-15. Polifka JE, Friedman JM. Teratogen update: Azathioprine and 6-mercaptopurine. Teratology. 2002;65:240-61. El-Azhary RA. Azathioprine: Current status and future considerations. Int J Dermatol. 2003;42:335-41. Anstey AV, Wakelin S, Reynolds NJ. Guidelines for prescribing azathioprine in dermatology. Br J Dermatol. 2004;151:1123-32. Zwerner J, Fiorentino D. Mycophenolatemofetil. Dermatol Ther. 2007;20:229-38. Orvis AK, Wesson SK, Breza TS, Church AA, Mitchell CL, Watkins SW. Mycophenolate mofetil in dermatology. J Am Acad Dermatol. 2009;60:183-99. Li J, Chong AH, Green J, Kelly R, Baker C. Mycophenolate use in dermatology: A clinical audit. Australas J Dermatol. 2013;54:296-302. Kalia S, Dutz JP. New concepts in antimalarial use and mode of action in dermatology. Dermatol Ther. 2007;20:160-74. Rodríguez-Caruncho C, Bielsa-Marsol I. Antipalúdicos en dermatología: mecanismo de acción, indicaciones y efectos secundarios. Actas Dermosifiliogr. 2014;105:243-52.
van Beek MJ, Piette WW. Antimalarials. Dermatol Ther. 2001;14:143-53. 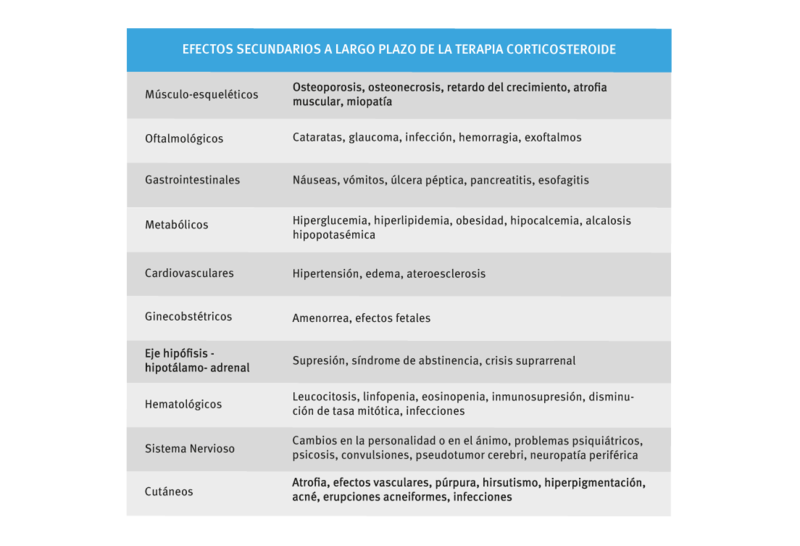 González-Sixto B, García-Doval I, Oliveira R, Posada C, García-Cruz MA, Cruces M. Aspectos prácticos de la quinacrina como tratamiento del lupus eritematoso cutáneo: serie de casos. Actas Dermosifiliogr. 2010;101:54-8. Amor KT, Ryan C, Menter A. The use of cyclosporine in dermatology: Part I. J Am Acad Dermatol. 2010;63:925-46. Amor KT, Ryan C, Menter A. The use of cyclosporine in dermatology: Part II. J Am Acad Dermatol. 2010;63:949-72. Colombo D, Poggi S. Clinical profile of cyclosporine in dermatology. Drug Dev Res. 2011;72:634-46. Cather JC, Abramovits W, Menter A. Cyclosporine and tacrolimus in dermatology. Dermatol Clin. 2001;19:119-37. Kim J, Chan JJ. Cyclophosphamide in dermatology. Australas J Dermatol. 2016;50:1-13. 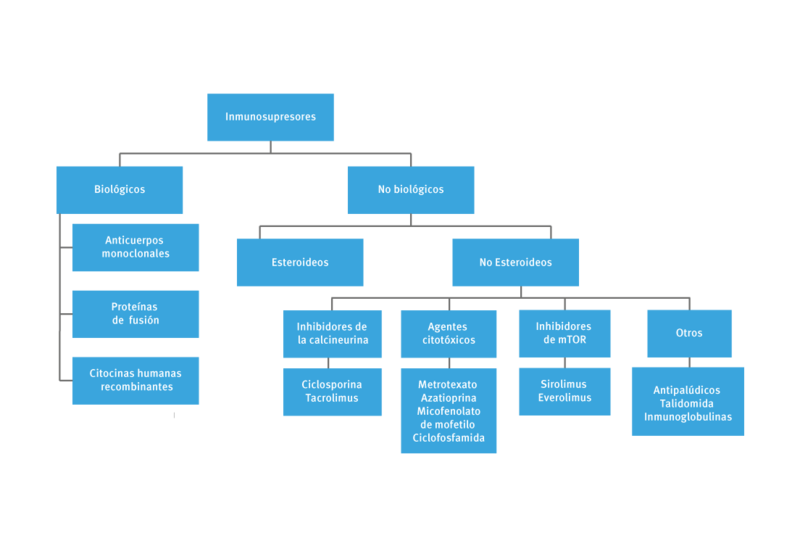 Ghate J. Immunosupressive therapies in dermatology: Cyclophosphamide. Curr Probl Dermatol. 2000;11:265-6. Goyal A, Goyal K, Merola JF. Screening and vaccinations in patients requiring systemic immunosuppression: An update for dermatologists. Am J Clin Dermatol. 2015;16:179-95. 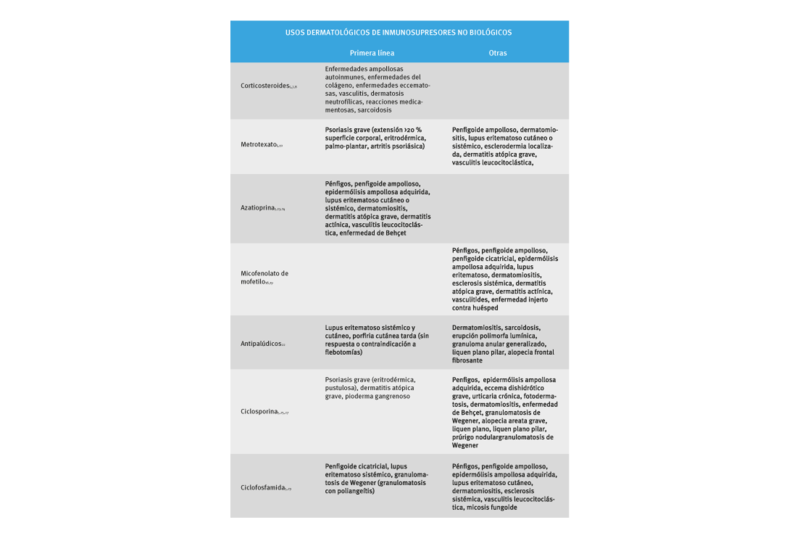 Keith P, Wetter D, Wilson J. Evidence-based guidelines for laboratory screening for infectious diseases before initiation of systemic immunosuppressive agents in patients with autoinmune bullous dermatoses. Br J Dermatol. 2014;171:1307-17. Siddiqui AA, Berk SL. Diagnosis of Strongyloides stercoralis infection. Clin Infect Dis. 2001;33:1040-7. American Thoracic Society. Targeted tuberculin testing and treatment of latent tuberculosis infection. MMWR Recomm Rep. 2000;49:1-51. Weinbaum CM, Williams I, Mast EE, Wang SA, Finelli L, Wasley A, et al. 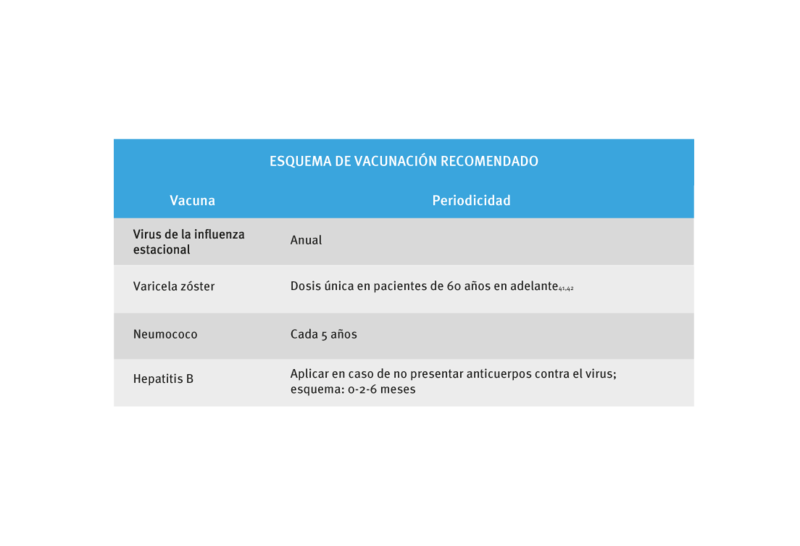 Recommendations for identification and public health management of persons with chronic hepatitis B virus infection. MMWR Recomm Rep. 2008;57:1-20. Hoofnagle JH. 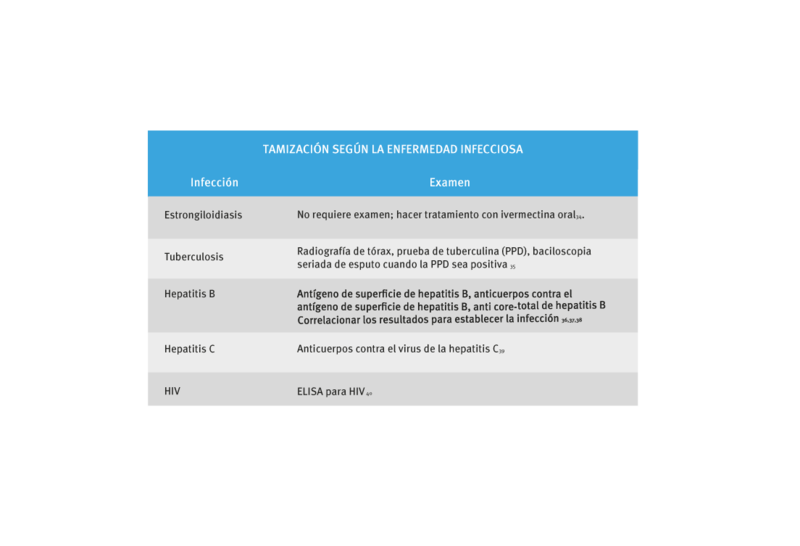 Reactivation of hepatitis B. Hepatology. 2009;49:156-65. Ito S, Nakazono K, Murasawa A, Mita Y, Hata K, Saito N, et al. Development of fulminant hepatitis B (precore variant mutant type) after the discontinuation of low-dose methotrexate therapy in a rheumatoid arthritis patient. Arthritis Rheum. 2001;44:339-42. Alter MJ, Kuhnert WL, Finelli L. Guidelines for laboratory testing and result reporting of antibody to hepatitis C virus. MMWR Recomm Rep. 2003;52:1-13. Şanlıdağ T, Akçalı S, Ecemiş T. Investigation of the correlation between anti-HCV levels (S/Co) with HCV-RNA in the diagnosis of hepatitis C virus (HCV) infection. Mikrobiyol Bul. 2016;50:508-10. Roberts K, Macleod J, Metcalfe C. Hepatitis C – Assessment to Treatment Trial (HepCATT) in primary care: Study protocol for a cluster randomized controlled trial. Trials. 2016;17:366. Moyer VA; US Preventive Services Task Force. Screening for HIV: US Preventive Services Task Force recommendation statement. Ann Intern Med. 2013;159:51-60. Barin F, Meyer L, Lancar R. Development and validation of an immunoassay for identification of recent human immunodeficiency virus type 1 infections and its use on dried serum spots. J Clin Microbiol. 2005;43:4441-7. Prazuck T, Karon S, Gubavu C. A finger-stick whole-blood HIV self-test as an HIV screening tool adapted to the general public. PLoS One. 2016;11:1-10. Sitaras I, Rousou X, Kalthoff D. Role of vaccination-induced immunity and antigenic distance in the transmission dynamics of highly pathogenic avian influenza H5N1. J R Soc Interface. 2016;13:1-15. Harpaz R, Ortega-Sánchez IR, Seward JF. Prevention of herpes zoster: Recommendations of the Advisory Committee on Immunization Practices (ACIP). MMWR Recomm Rep. 2008;57:1-30. Albrich W. Pneumococcal vaccination for children and adults. Ther Umsch. 2016;73:235-40. Chakravarthi PS, Ganta A, Kattimani VS. Adult immunization -Need of the hour. J Int Soc Prev Community Dent. 2016;6:272-7. Centers for Disease Control and Prevention (CDC). Impact of vaccines universally recommended for children – United States, 1990-1998. MMWR Morb Mortal Wkly Rep. 1999;48:243-8.